Nest Check, Hawk and a surprise! I have had a busy day so without further adieu-the nest check! For a grand total of 69 eggs and 10 young. As usual, the red tailed hawk continues to make lazy attempts at catching one of the martins. I am not very good at raptor ID, so for all I know, it is a immature hawk practicing. The attacks always frighten and always send the martins up in a flurry of purple. He sat on the top of the purple martins favorite slash pine and was punished for his impudence! Martin after martin dove and harassed till he eventually flew off in disgust. He almost seemed embarrassed. Unfortunately, I am sure he will recover and visit again. Come fledge time, I am already making plans to sit out on a lawn chair and babysit. For today perhaps the hawks are busy chasing down mockingbird fledglings that keep finding their way into our garage…much to the chagrin of their parents. I had a series of firsts for today. I witnessed my first pipping egg, which is simply put, an egg in the process of hatching. It is pretty amazing and very slow. The nestlings little beak is just visible through the small hole that it has pecked through the shell. The nestling will have to slowly chip at the egg, the entire circumference of the egg. Since this is the last egg in this nest, there is no danger of the shell becoming encapsulated. An encapsulated egg can cause the death of the nestling inside and should be watched for. During nest checks if portions of the shell remain in the nest, you should remove the pieces. These egg shells can fall over unhatched eggs and trap the nestlings inside-encapsulating them within. My other first was 2 eggs discovered on a Shepard’s hook gourd. 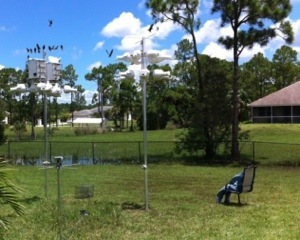 The first year I put up housing for purple martins, the first birds that landed on it were Tree Swallows. Now at the time, I did not know that the Tree swallows were only migrating through, as south Florida is a bit too far south for them. I put up the shepards hook as a “just in case”. I placed it about 35 feet from the purple martin housing and every year I get a male who claims it. Last year a pair built a nest but no eggs were ever laid in it. I think it was just an extra nest built by a pair that nested in one of the other gourds. This year appears to be different. I checked the shepards hook, more as a courtesy, not really expecting to find anything, and lo and behold!!! 2 shiny white eggs! The Shepard’s hook is not more than 5 feet in total height. It has an aluminum stovepipe predator guard, that I wax every year. And now it has 2 eggs! Time will tell if the eggs will be tended to. Perhaps they were just dumped there. A female needing to lay eggs but not having a mate, nest, or the inclination to tend to them. But there they are. I hope they will be OK. It does go to show how martins will overcome many “imperfect” site issues for the sake of being within the safety of a large colony. 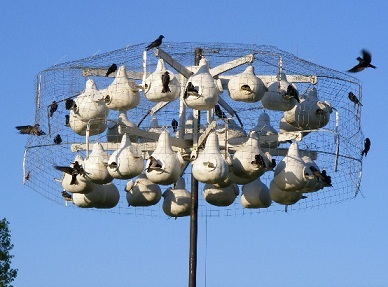 As most people will tell you that the ideal height for a purple martin nest is at LEAST 10 feet, 12-15 even better. So a 5 foot Shepard’s hook is a stretch. As I did todays nest check I looked up at one point and saw well over 45 birds flying about. I was dumb-founded and I must say it was an impressive site. As always, my heart skipped a beat. Jose greeted me today with a hearty “Hola!” and an invitation to have his Jell-o. He only likes the red Jell-o and he only gets the green. He tells me he has made several complaints-to no avail. I could tell him that hospitals and “homes” usually never give red Jell-o but I decide to nod my head in understanding. He finishes off his lunch and I wheel him to the courtyard. I had many questions reeling in my head to ask him. About his martins, what brought him to Florida, his life in South America, his family or apparent lack there of. Today though, we will talk of Purple Martins. A subject free of any sadness or memories that can cause pain. He talks of his memories of hundreds of thousands of birds flying free and his spirits rise like they are lifted up by the martins themselves. Jose was a handyman by trade. Odd jobs, car repairs, unlicensed electrical work was his forte. He laughed at my reaction to at least 4 stories of how he checked for current to electrical outlets and light sockets. I suppose whatever investment it would take to purchase a volt meter was out of the question. He would stick his finger in the socket. My disbelief is still quite strong even after his vehement and at length explanation on the difference between amps and watts and volts and I don’t even know! 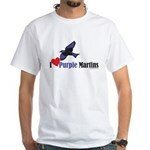 But on to the Purple Martins. Of course Jose…and I will see you soon. How much longer can my good luck last? As a well trained pessimist (Thanks Mom) I know that at some point my good luck will turn. The martins are bold and noisy and oblivious to the threats in their neighborhood. Approximately half a dozen birds were out past sunset again. The noise they made bickering for a place to sleep, though music to me, is like a dinner bell to the hawks that I know live nearby. I don’t know if it is a good thing but a pair of Red-shouldered hawks is nesting down the block-less than 1/4 mile away. Hopefully that will keep the more dangerous hawks, like Coopers and Sharpies, away. Whenever I am outside I keep my eyes open for any hawks. The neighbors don’t know why I occasionally pound the fence with rocks but that’s OK. The martins may not know either-but it gets them up and in the air. Yeah, I know…I’m whacked. I have been working on 2 more gourds and am waiting for the caulk to dry before I hang them. But for now the “No-Vacancy” sign is up. I am not sure how many birds I have turned away due to lack of room but I have counted upwards of 30 birds.